Let's get down to my random five because this week everything has been pretty random. One. Can we talk for a minute about how crazy toddlers are? They are climbing everything. They are running around like crazy. They are tripping over their own feet. They are the master at finding everything you hide. They are talking up a storm. And they are just go go go. Well this week, Sutton has had two incidents that have left her with some serious boo boos. First, on Tuesday she was standing on the table at daycare and was told to get down and was being a bit defiant, but finally got down and as she was getting down she fell off and bruised her cheek. Then Thursday she was walking along, tripped and bit her lip. Now she has a fat lip and it looks so brutal. Poor baby girl. She is wearing a shirt I got for the girls during my work trip in Israel. Two. My awesome coworker has been brewing beer for a few years now and I love when he brings in his beer for some of us to sample. Since my husband works with me, we get two bottles every time and this time they are huge!!! I can't wait to try his red rye beer. Three. Have any of you tried the new bralettes from Victoria Secret? I have one from about a year ago that I adore (from VS), but they don't carry that exact one. So I am on the hunt for a new one. I want one with a bit of lining, but it doesn't have to be that much. Any experience with either of these? Four. Gilmore Girls. Did anyone see the article on Today about a town in Connecticut that is transforming their town into Stars Hollow for a few days? It was the town that inspired Stars Hollow, so it seems very fitting. I wish I could go. I have been cranking through the episodes this week since Rory was in NYC. Almost onto season 6! Can we move here please? Five. We are headed to Northern California this weekend. It will be a short quick trip, but we get to see family (and snuggle my nephew), enjoy Point Reyes oysters and celebrate a few things. We are leaving bright and early Saturday morning for the four hour car ride. Let's hope the girls can handle their car seats for that long. Poor sutton! You know how Jack is.. I've started calling him bruiser! I can't wait for the new Gilmore girls to come out. I need to go back and watch on Netflix! Have a fun trip and enjoy the baby snuggles!! I sh*t you not, Avery gets hurt at least once a day! It's insane. I'm sorry about her fat lip! My BIL brews beer too so I know how awesome it is to sample! Have a good trip, and hopefully the car ride goes smoothly! I want to go so badly too. Pretend to go to Luke's every morning. So much fun. Haha. Have a great weekend. Oh poor baby with that lip. Hopefully it looks worse than it feels! I hope so too. She is still eating like a champ, but a bit fussy. 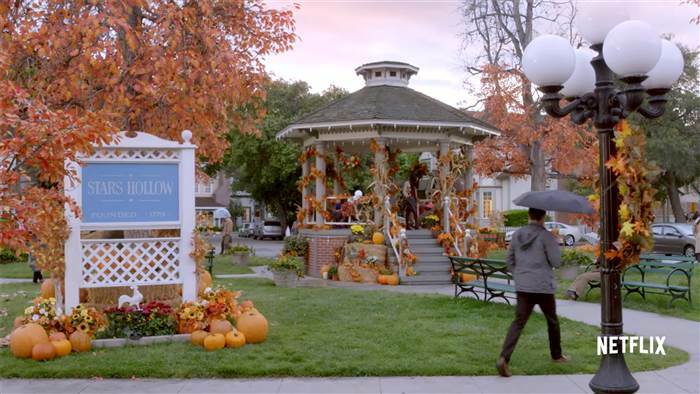 Living in Stars Hollow sounds heavenly! So neat that town is doing that! I want one of those bralettes now! Oh no, the poor baby. Hope her lip heals soon. Hope you have a good trip! Safe travels. I don't have a VS bralette, but I LOVE the left one!!! Hope you have a great weekend! Poor Sutton!! Her little lip looks so sad! Hopefully she'll feel better soon! And I really REALLY need to start Gilmore Girls. I've heard everyone talking about how wonderful Stars Hollow is and I feel left out because I don't have a clue what y'all are talking about... if it looks like that picture you posted, I would love to move there. It looks so quaint! I hope you guys have a great trip this weekend! Enjoy! I love this post and love hearing all about what the kids are getting into, these days! It's so crazy how they can get so hurt, so fast! Good luck traveling!! Thank you! It is crazy to watch my girls grow and learn. I love it! Thank you. And I will have to check them out. Thanks for the heads up. Ahh I NEED to go to that festival! Even with a fat lip, she's still a cutie! Hope you had a great trip! Awe thank you. I would have to agree. Did you see how much they are charging for the festival?!? It's $250 just to get in. They are going to make a fortune. I would love to go! Hope that puffy lip heals quickly. I completely understand. While we were on vacation Liam got a cut on his eyelid a goose egg on his forehead and a bruise on his cheek. He looked so beat up!